Betty Skinner, owner and director of the Betty Skinner Insurance Agency, is releasing information on a charity drive encompassing the greater Seattle region to help raise awareness and donations for research into cures and treatments for Alzheimer’s disease. A team member working at the firm, Maggie Wilson, has a grandmother living with Alzheimer’s. 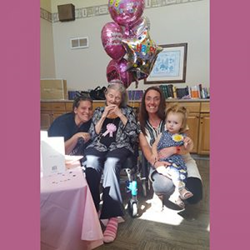 “Our agency wants to do everything possible to not only support Maggie’s grandmother but to help others in our community and nationwide who are battling Alzheimer’s,” said Skinner. The Agency will be gathering referrals from community members who wish to receive a no obligation quote on a new insurance plan. For each person referred into the firm in this way, the Skinner team will make a monetary donation to the Alzheimer’s Association. More information on the charity drive can be found on the following page: http://bettyskinnerinsurance.com/rewards/.